Published in: Leonhardi, H. von (1864). De bisher bekannten Oesterreichischen Armleuchter-Gewächse besprochen vom morphogenetischen Standpuncte Naturforschern und Philosophen. Verhandlungen des naturforschenden Vereines in Brünn 2 (Abhlandungen): 122-223. This is the type species (lectotype) of the genus Tolypella. 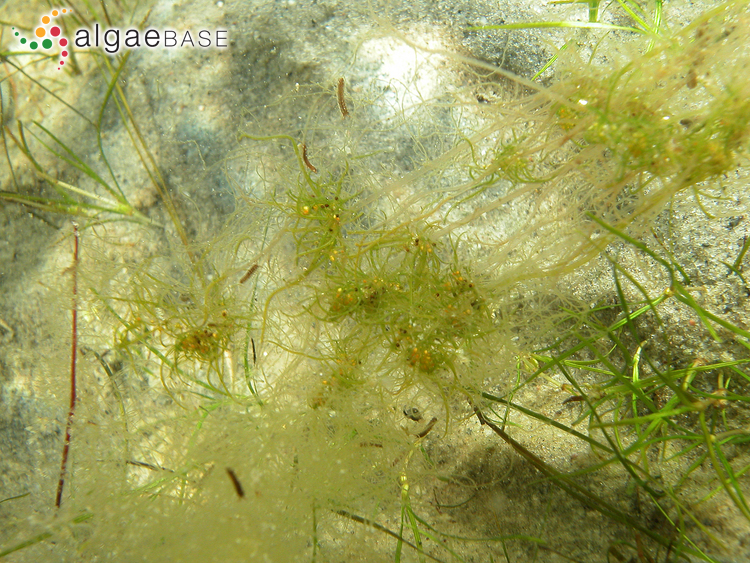 English: Bird's Nest Stonewort (Stewart & Church 1992). Swedish: Havsrufse (Tolstoy & Österlund 2003). Tolypella nidifica is up to 20 cm in length, dark brownish-green in colour and unincrusted. The axis is up to 1 mm broad. The sterile branchlets are simple. The fertile whorls are forming dense heads. The branchlets are once divided, and have normally only one node (rarely two) which has 2-4 rays. The end segments are 3-5 and the end-cells are obtuse. The species is monoecious. 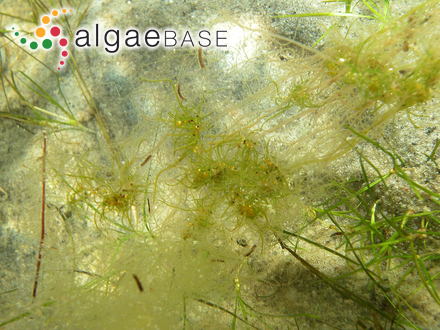 The oogonia are clustered 2-4, globose and up to 600 µm long. The oospore is black to dark wine red and up to 500 µm long. The antheridium is less than 500 µm in diameter. 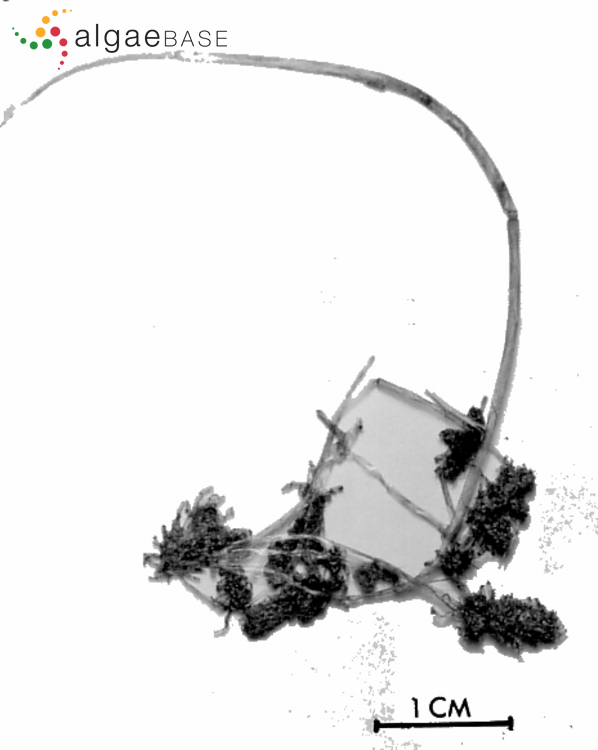 T. nidifica f. groenlandica differs from the type by having a very long unbranched terminal process, in the specimen (see photo) this is 6 cm long and 1 mm broad (Langangen 1996). End-cells obtuse, with sterile branchlets. Large plants in brackishwater. Braun, A. (1857). Über Parthenogenesis bei Pflanzen. Abhandlungen der Koniglichen Akademie der Wissenschaften zu Berlin 1856: 311-376. Krause, W. (1997). Charales (Charophyceae). Vol. 18 pp. 202. Jena: Gustav Fischer. Langangen, A., B. Hansen & H. Mann (1996). The charophytes of Greenland. Cryptogamie, Algologie 17(4): 239-257. Accesses: This record has been accessed by users 3042 times since it was created. Groves, J. & Bullock-Webster, G.R. (1917). Tolypella nidifica Leonh.. General Irish Natural History 26(8): 134-135.